I've been battling the castle door issue for some time. It presented itself as two issues, one door wouldn't open all the way and the "RESCUE" mode kept being triggered without being in the upper playfield (as well as the doors opened way too easily). The door opening issue was a dying motor, not such an easy thing to replace but cheap enough and it solved the issue. I've posted several times about how to properly adjust the switches and springs that hold the door closed and trigger the door "hit". I just couldn't get a setting that had enough tension on the spring to keep the door closed (and the switch depressed) but allow enough "slack" that the motor could pull the door open. It's a fine balance, it seems. After battling with the existing parts I went ahead and ordered new switches and springs from JJP. Unsoldered the switches, soldered in the new, replaced the springs. I would have thought this would surely solve the issue. Come to find out that whatever the situation is with the new parts the springs were WAY too "springy" and kept the doors from opening at all. I don't understand how this could be, they are brand new parts. Nothing is binding on the doors (they are properly spaced), the hex head screws that hold the doors posts to the motor were fully tightened, one door motor was brand new, etc. After puzzling this over in my brain for a while I came to the conclusion that the overall issue is that the door switches rely on a lot of tension to keep the plunger depressed. The geometry of the little "flap" on the door post that hits the switch actuator requires a LOT of rotational torque to keep it depressed because the switch is situated so very close to the door post. 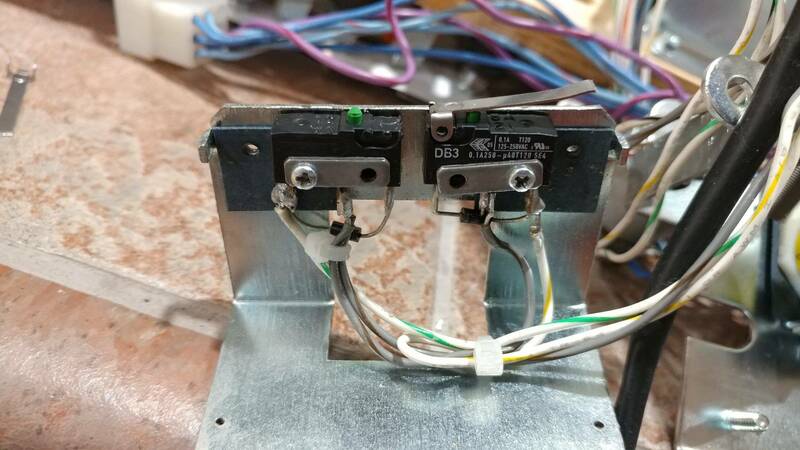 If you could move the switch away and/or provide a lever and fulcrum (like how most switches are used in pinball) it would allow for much less force to keep the door closed/switch depressed. I mocked around with some ideas and luckily I had some DB5 switches with some really long, flat tangs on them. I was just going to transplant the tangs on to the existing (new) DB3 switches but for some reason one of the existing (new) switches was missing the posts that the tang mounts to. In either case, I replaced one of the DB3 with a DB5. I did notice that the DB5 (which has a black plunger) requires substantially less depression on the actuator to click. Not sure if that is designed in to them (green means more?) but it was noticeable. In the picture attached you can see I trimmed off a lot of the tang and put a very slight bend in to it (which sort of matches the space between the post flap and the lock bar, basically the space the door needs to move to trigger the switch). I also repositioned the switch mounting, moving them inboard one entire hole. In the picture you can see one switch with the tang on it. I still had to fuss with the springs a bit, cutting off some loops and then stretching it ever slightly so that it provided enough tension to keep the switch depressed but not so much that the door couldn't open. I'm glad to say this was a massive success in solving my issue. The doors trigger solidly now without any unwanted triggers and they open with a nice snap, fully. Ideally I will drill and tap some new holes (I don't even know if I have a tap that size, nor a screw and washer that would fit all the way through) to fully screw in the switches (and move the fiber backer) but they seem pretty solid even with one screw. It seems like this was a design flaw, which makes sense since the YBR is getting a modified mechanism. I wonder if the modified upper playfield (I hear there is only one door for the castle?) and the door mech would be available for a swap. In either case, I think my solution would have been better from the factory, reducing the force needed to open the doors greatly (which probably extends the life of those motors, especially since they don't have a limit stop on them) and reducing the tension to keep doors closed and switches depressed. Hopefully the pic says it all, after my several paragraphs.